In cities like Bhubanswar, one could easily know a festival is nearby, from the vending stalls that mushroom at each and every corner of the locality, selling the items related to the festival. 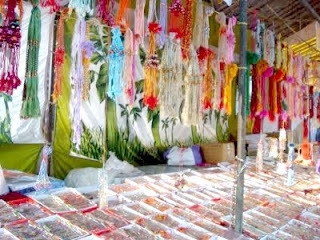 The most significant of all is the stalls of the colourful strings – Rakhi, displayed in various forms and design, that remarks the nearing of Rakhi Poornima, the full moon day of Hindu Month of Sravan. a unique festival on which a sister tie a colourful string on the hand of her brother wishing to strengthen the bond of her selfless love for him. As a child, I waited for this festival eagerly. We being two boys of our parents, devoid of biological sisters, never felt the loss significantly because we received the love of our cousins both from our mother and father side on the eve. Then………, I never cared about the one who tied the string on my hand; rather cared about the type & design of Rakhi they all tied on my hand. I was very comparative to the one tied on my brother’s hand. I liked most the big sponge flower Rakhi with a picture of lord Jagganath at the centre of it. Then on Rakhi poornima has come every year with new colours. My interest reduced from the type and design of Rakhi and increased on the one who tied it on my hands. They are the sweet angels in my life, who have inspired, encouraged, helped & above all loved me like their own brother. During those days when I used to have zero income and entirely depended on my parents, Bou (My mother) use to loan me Rs. 200 to Rs. 250 on nonreturnable basis so that I can buy gifts for the ones who would come to tie Rakhi on my hands. The night before I use to prepare a list of the probable numbers of sisters who might come to tie Rakhi to me and accordingly fix my budget for buying gifts for them. It included my cousins, younger and elder girls from our colony and few friends. And every time I was always short of gifts! I still remember one of the sweetest moments of Khusboo, a kid of three, daughter of a family friend, who eagerly tied rakhi once on my hands with a broad smile on her face. The little one, though never had knowledge of making a knot, tried her best and was successful to give one knot, which is still tight in my heart. I remember of Mina didi, my elder cousin, who is no more in this world, who never missed a single visit from Cuttack on the eve of the festival till she got married. My hand misses her rakhi very much every year. Still my younger cousins Priya and Pinki, who are now well earning professionals, have taken up E-portal to have it ensure that the most latest fashionable raki reaches me in time! I don’t know, what this festival mean to others and but to me it’s a festival to start and maintain a pure relation between two souls which is far more long lasting than any other relations.